Packing your own lunch for work or school is one of the best ways to lead a healthy, economical lifestyle. A crucial part of a successful packed lunch is a quality thermos. Imagine this – it’s lunchtime at work, and you’re starving. You open up your freshly cooked lunch that you packed in the morning, only for it to be disappointingly cold. A sad start to your day! That’s why having the best stainless steel thermos is so important. 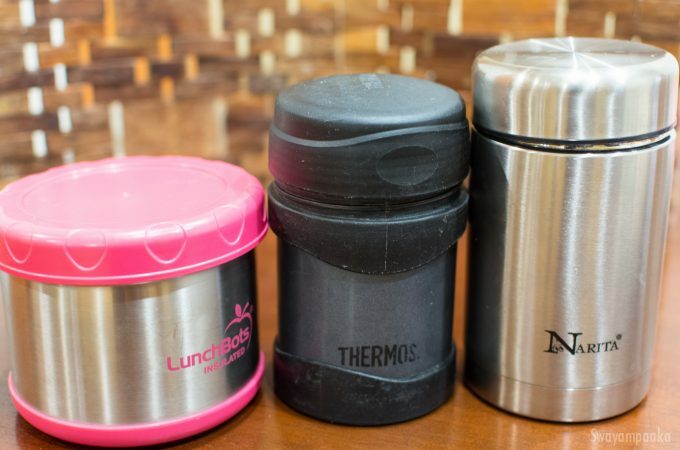 After much trial and tribulation, I’ve found what I think is the best stainless steel thermos lunch box with a stainless steel lid, easy to wash, and keeps your food hot! When you visit retailers or do a quick search on Amazon, most of the stainless steel food containers you’ll come across have plastic lids that touch your food on the inside. Even though many of the newer ones are BPA free, knowing that only the stainless steel of the thermos is touching my food gives me peace of mind. It’s not healthy to have plastic touching hot food, as it can leach harmful compounds into your otherwise nutritious meal. I set out on a search to find a insulated food jar with not only a stainless steel interior, but also one with a stainless steel lid. For many years, we’d been using one of the standard thermos containers. It was a 16 oz version of this Thermos Vacuum Insulated Food Jar. It kept the contents hot for a long period of time – packing Mysore Sambar at 8:30am would stay piping hot until 12-1pm. That’s where the pros of this thermos end. The lid on this thermos is plastic, which I was trying to move away from. It’s also difficult to wash, as it’s very narrow and hard to reach the bottom of the jar. The gasket is reasonably easy to remove. 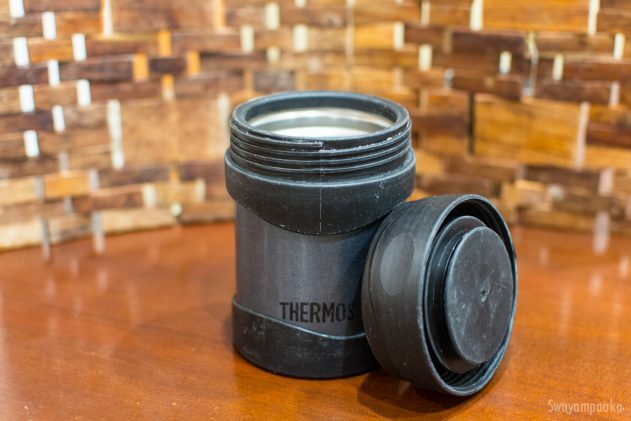 Verdict – NO: Although it maintains the temperature of the food, I cannot recommend this thermos jar since the plastic touches the food and it is difficult to wash. The first stainless steel thermo lunch box I tried was the LunchBots Insulated Food Container. First, lets cover the pros. It’s very wide, like a traditional lunch box. This makes it extremely easy to clean. It’s by far the easiest thermos food jar to wash out of everything I’ve tried. 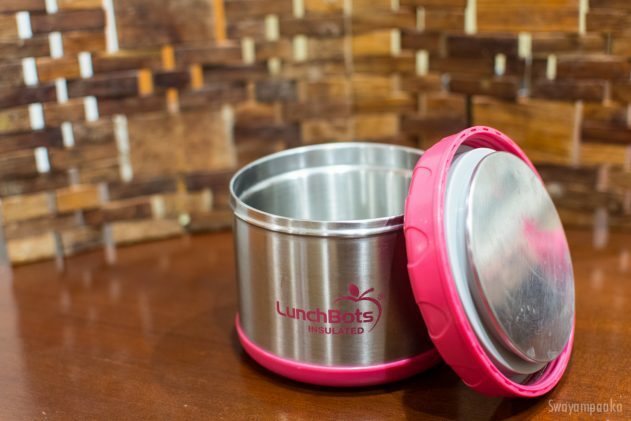 It also has a stainless steel lid that touches your food, rather than plastic. However, it does not retain the temperature of the food very well. A hot meal would have become lukewarm within 4-5 hours. I haven’t had a chance to try out the new 2017 model which they say has better heat retention. Let us know if you try this out. Verdict – OK: If ease of washing and eating is your main concern and you can deal with lukewarm food, the LunchBots Thermal container is your best choice. Some creative reverse-google-image searching turned up an interesting option on eBay. This was the Narita Thermos Vacuum Insulated Food Jar. At 18oz, it’s the biggest of the three. It has not only has a stainless steel lid and interior, but also a stainless steel exterior. Although I’d never bought anything on eBay before, this product shipped from California and was interesting enough that I decided to go for it. I’m glad I did. While not as wide as the LunchBots thermos, it is considerably wider than the Thermos brand, making it relatively easy to wash. The food stays also stays as hot as the Thermos brand. And most importantly, it also has a stainless steel lid. The catch is the gasket – it requires a little cleverness to get the gasket out of the lid. I use a spoon to scoop the gasket out. However, the quality of thermos makes up for this in my eyes, so this is the thermos I’ll be sticking with for now. Verdict – BEST: If you can live with a slightly less wide container with a finicky gasket, this is the best of all worlds. 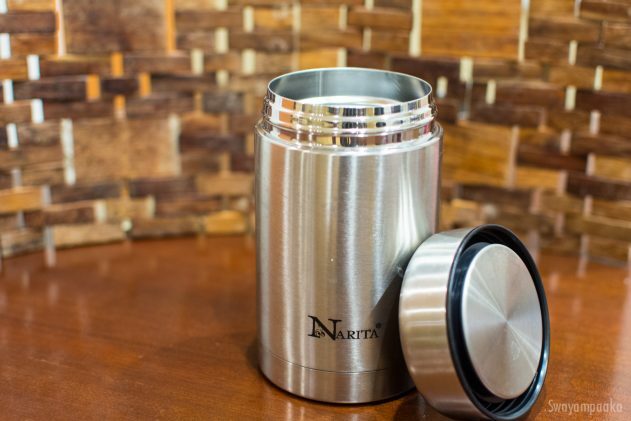 The Narita Thermos Vacuum Insulated Food Jar is my recommendation for best stainless steel insulated food jar. WARNING for ANY THERMOS: Remember that if you are putting extremely hot contents (like hot sambar rice off of the stove), it will be burning hot – make sure you use caution while eating so you do not burn yourself.